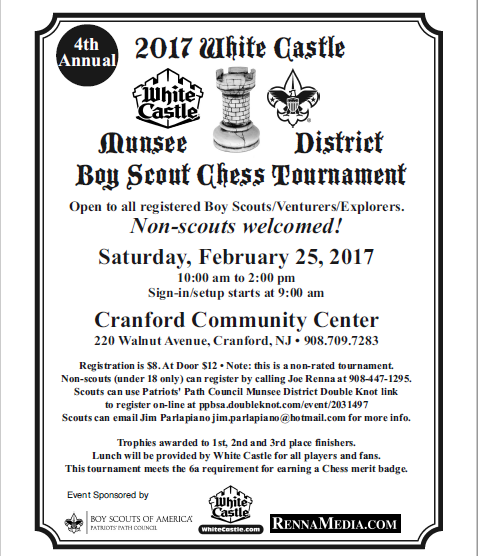 Tomorrow, I will be directing the 4th Annual Munsee District Boy Scouts' Chess Tournament at the Cranford Community Center, 220 Walnut Ave, Cranford, NJ 07016. 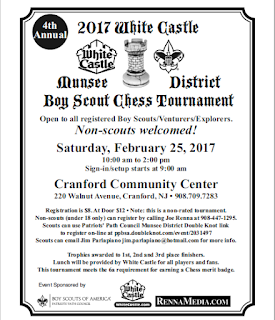 All boys and girls who are Boy Scouts, Adventurers or Explorers and know how to play chess can play in the event. Sign-in is between 9:00 and 10:00 a.m. Non-scouts are also welcome. This non-rated event is sponsored by Renna Media, which is supplying trophies & White Castle, which will be providing lunch! For registration details and more info, double-click on the image below.